As club secretary, one of my many jobs is to promote the club among the angling fraternity and to try my best to keep new anglers from losing heart, as river fishing is, in my opinion, the most demanding form of the art. The time to fish and the information gained from your own experiences and, of course, asking others for tips and ideas. Patience comes with age, but alas so does death, so try to balance fishing the Derwent somewhere between the two and you wont go too far wrong! As golfer Arnold Palmer once said, “People say I’m lucky… Well, the more I practise, the luckier I get.” The same is undoubtedly true of river fishing. I can’t help you with patience or find you more time to fish, so I’ve decided to help with the information side of things, as I often get asked what flies to use on the river, what kind, what size and when to use them. To some people it’s a secret never to be shared, but as I want members to catch fish and enjoy the entire fishing experience, I’ve decided to spill the beans – or at least the ones I am aware of. As the season begins, chances are the river’s wild fish will be nowhere to be seen as they are far too sensible to be out and about in March – only people are that daft. So that leaves us the stocked fish, by and large. As the days warm up and the fish begin to feed, imitative fly fishing comes into its own. As far as wet flies go, you won’t go far wrong with Pheasant Tail Nymphs, Hare’s Ears, Tiny Miracles and the Mary, which was invented by the River Derwent’s very own Simon Robinson, who is one of three DAA members in the current England world champion fly-fishing team. These flies can do a job in sizes from as big as 12, all the way down to 20, tied both with and without bead-heads. In the early part of the season, gold is good, but as the weather warms up, ring the changes and give copper-heads a try. Silver and black are also good, especially in heavily fished areas. The river is blessed with fine hatches of large dark olives (Baetis rhodani), which usually – but not invariably – hatch between 11am and 3pm. If you are there when it happens, the fishing gods are smiling. But if you miss it, you will swear there are no fish in the river. Try a Parachute Adams or a CDC olive to match the hatch. In mid to late April and sometimes into May, depending on the weather, the river banks will be covered in hawthorn flies, which will be blown in their thousands onto the water where fish quickly switch on to this free meal. Keep at least half a dozen of these flies in a dry fly pattern and keep an eye out for when they’re on. Other flies to watch out for early on are caenis and midges. Both require a tiny presentation and I have always found a Griffith’s Gnat in a 20 or thereabouts is a good choice. As long as you can tie them on, of course – the older I get the more smaller the hook eyes seem to get! I took a good friend of mine fishing at Ebchester over the summer; he used to be a member but due to family commitments had given up his licence years ago. So I kitted him out with an old 8ft rod and a 4# line and off we went. The weather was far from perfect – cold and overcast with nothing hatching – but we soldiered on. I put him in a likely spot fishing a ginger Klinkhammer, hoping that the day would not be a complete loss. So he cast out his first fly on the river in ten years and, would you believe it, a 2lb brownie took as soon as it hit the water! After a memorable tussle, the fish was released and my friend, well, he is rejoining next year, and if the grin on his face was anything to go by, he is well and truly re-hooked. Now for a couple of the best-kept secrets on the Derwent: the Brook Dun and the Mayfly hatch. I’ve linked these together as one follows the other and they are often mistaken for each other. The Brook Dun (Ecdyonurus torrentis) is earlier by about a week and a tadge smaller and darker, with two tails to the Mayfly’s three. These hatches really bring the fish to the surface and are particularly abundant in the lower part of the river from Lintzford and above. Then of course we move on to the legendary Mayfly (Ephemera danica) and its arrival in late May/early June. A key feature of the Derwent is its descent from the North Pennines down to the Tyne, and this drop in altitude does us a great service as it allows us to actually follow the peak May fly hatch up the valley, making the hatch last for four to six weeks. 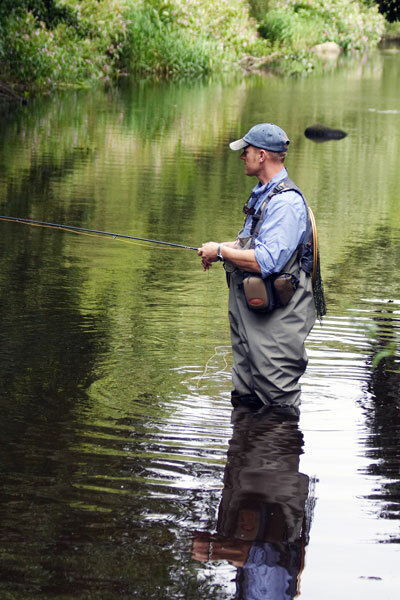 Some call this time duffers’ fortnight or dry fly heaven, as the fish are easier to catch. I say, rubbish – they are never easy, they are just a little bit more accommodating. So do yourself a favour – book yourself a few days off in early June and have some fun. But remember that during this time, millions of other small may and stone flies have been hatching, as well as terrestrials, so have a look at what’s on the water and don’t put all your eggs in one basket. Let me tell you the tale of the one-eyed trout… It was a lazy early summer evening when two friends decided to fish the Mayfly spinners returning to lay their eggs in the stumps pool below Shotley weir. One fished upstream from the tail of the pool and the other fished from the middle. A couple of tidy brownies were caught and returned but nothing to set your heart racing, until with a crash and a splash a very nice trout rose between the two men. The friend below covered the fish as the one above watched the scene play out. Time and again the trout rose to naturals but steadfastly refused the fly, to the disappointment of all concerned. As the first angler changed his fly, his friend, some (but not I) would say unsportingly, tried his arm and cast. First drift, it only went and took. A tall tale, I hear you say? Well, just ask the disgruntled fisherman – he’s the guy whose picture’s at the top of the page. I’m sure he’s calmed down a bit now though. Anyway, where was I? Ah, yes… Once the water really warms up, fish move into the fast water for food and oxygen so that is where we fish for them. A tried and trusted method is the New Zealand dropper method, AKA klink and dink. This is a real searching method and involves fishing a buoyant Klinkhammer on the dropper with a small bead-headed nymph on the point. Some people rig this slightly differently by attaching a dropper to the bend or even the eye of the Klinkhammer. The length of the dropper varies depending on the depth and speed of the water, but about 18 inches or so is usually a good starting point. 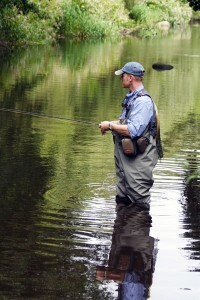 Fish in the fast water and strike quickly if a fish takes the dry fly or if the dry is dragged under. In this case, the dry fly is acting as your strike indicator so keep a close look out and use Polaroids, especially on bright days, to make your bite detection easier. You can if you like replace the klink with a sedge, especially when we move into the evenings. As to how many types of sedge flies we have on the river, your guess is as good as mine. Try different coloured bodies in peacock, red, green and yellow, and vary hook size to match the hatch. As darkness arrives, the river can seem to teem with fish as they gorge themselves on sedges and spinners, either spent or laying eggs. Keep at least a few cherry spinners for these never to be missed moments. As the weather starts to cool down and hatches become less commonplace, things begin to slow down a little on the river. Spiders can often work well at this time of year, although the abundance of leaves in the river can make bite detection a bit tricky if you’re fishing sub-surface. As trout gradually begin to go off the feed, grayling begin to wake up, although they tend to be in ones and twos rather than the shoals we all hope to run into during the winter. Unfortunately, we lost many of our grayling in the recent pollution incident which took place between Allensford and Ebchester weir last February 2009. To help replace these fish, Northumbrian Water and the Environment Agency stocked 3,000 small grayling in the affected area and will add to these numbers in the next few years. The good news though is that there is still good fishing to be had above Allensford and on the lower stretches of our water. Flies to use include Klinkhammers on the dropper and a Mary on the point for the fast water, and weighted nymphs with or without a strike indicator for the deeper pools. All grayling are to be returned and members are asked to use barbless hooks to aid a quick release back into the water. The grayling season on the Derwent is 16 June to 31 December and includes the whole of the club’s water, from Lintzford up to the reservoir. This is extended until 31 January from the Kings Head bridge at Shotley Bridge up to Allensford Bridge. A good tip is if your rod rings freeze up and your toes turn black it’s probably time to go home! Given the choice, I’d fish for grayling over trout any day, and don’t forget the club have excellent exchange tickets with local clubs with good grayling water so give it a go – I promise you not regret it.